Why Should Brands Learn The Language Of Emoji? Emoji’s have taken over the days of ‘txt’ talk and reimagined the way we communicate on a daily basis. Whilst there are only 26 letters of the alphabet, there are over 1600 emojis that bring alive the idea of character emotion and they show no sign of dying out any time soon! Oxford Dictionaries even awarded 2015’s word of the year to ‘Unicode U+1F602’ (the face with tears of joy emoji, to be precise); that is just a small step that the world of emoji talk has taken since we were introduced to it many years ago, it has evolved faster than any ancient language! In terms of business, 777% more marketing campaigns have used emojis this year in comparison with 2015, it is definitely a force to be reckoned with. Because of the major waves its making in the world of communication, it’s important to note that brands should be learning the language of emoji! Emoji’s are drastically changing the language of marketing with many online brands communicating through emoji’s. Brands use emoji’s when reaching out to their audience through online social media platforms; it’s a more engaging tool. 3. There’s always the desire to personify a business and this can easily be done by adopting emoji’s into the brands tone of voice. It allows you to communicate like a real person and appear more approachable. Your customers want human interaction and using emoji’s will provide that. 4. There may be a preconceived idea that emoji’s are only for the emerging youth… this is not true!! Using emoji’s in everyday language is not exclusive to a specific age and in fact 90% of 35+ year olds actually use emojis to communicate. You can reach out to all ages! 5. Twitter is a big player when it comes to social media and they have recently announced that advertisers can target people who have tweeted or engaged with tweets featuring emojis. Meaning that as a marketer you can analyse emoji activity and target even more people. 6. A picture, or rather an emoji is worth a thousand words. By using emoji’s you can get your point across more effectively, you can build emotion through one single character and that is what is great about adopting this language into the personality of your brand! 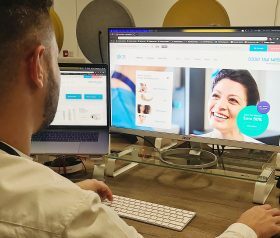 The team at Lightbox have been working closely with sk:n. The company are looking to transform their digital presence after experiencing a period of continued growth.